The Mikhailovsky Palace was built after the design of the architect Carlo Rossi between 1819 and 1825. The palace was erected for the youngest son of Paul I, Grand Duke Mikhail. He was the brother of Nicholas I.
Rossi decorated the facade of the building overlook­ing the square and the street leading to the Nevsky Prospect in a unified style. A wide granite staircase dec­orated with bronze lions leads to the doors. On the side of the portico, between the rounded windows of the first floor, Corinthian semi-columns rise. Rossi consid­ered the palace he created for Mikhail to be reminis­cent of the Louvre. The main staircase and the White Hall have survived to this day in their original appearance. In 1895, Emperor Alexander III ordered that a State Russian Museum be inaugurated in the Mikhailovsky Palace. The museum was inaugurated after the death of Alexander III in 1898. The palace was turned into a Museum of Russian Art. The decoration of the rooms and halls of the palace was altered in the course of adapting to the purposes of the museum. The base of its collection was composed by pictures of Russian Picture Gallery in the Hermitage and other collections of the emperor’s family. The museum had 37 exhibition halls. There were 434 pieces of art. To accommodate the quickly growing collections, a building was added to the west side and named after its architect, the Benois Block. The Benois Block was built after the design of the architect Leonty Benois with the participation of Sergey Ovsiannikov between 1914 and 1917. At the present time, the collection of the State Rus­sian Museum amounts to about 400,000 exhibits repre­senting national art from the 11th century to the present day. It includes collections of painting, graphic art, sculp­ture, decorative and folk art. The Department of Ancient Russian Art displays outstanding examples of icon-painting, including works by Andrey Rublev, Dionysius and Simon Ushakov wooden sculpture, carved stones and bone carvings, em­broidery and jewellery. Particularly rich is the collec­tion of art of the 18th to 20th centuries beginning with the first secular works of Peter’s age — works by Ivan Nikitin, Andrey Matveyev and Ivan Vishniakov — to paintings by the vanguard masters as Kasimir Malev­ich, Mark Chagall, Pavel Filonov and other painters of the 20th century. 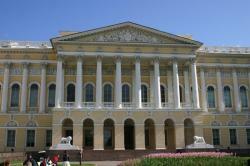 Now the State Russian Museum possesses the world’s largest collection of Russian art. The high railing separating the palace from the square is considered to be one of the best examples of wrought — iron work in St Petersburg. It is dissected by three gates. The main gate of this railing is decorated with military accoutrements. 44 bas-reliefs decorate the palace’s facade. These bas-reliefs were created by the famous sculptor Vasily Demut-Malinovsky. In front of the palace in the centre of the public gar­den there is a monument to the great Russian poet, Alexander Pushkin. This monument was unveiled in 1957. The inspired image of the poet was created by the sculptor Mikhail Anikushin.